The Tsar Bomba mushroom cloud seen from a distance of 160 km (99 miles). The crown of the cloud is 56 km (35 miles) high at the time of the picture. Notice the curvature of the Earth. Tsar Bomba (Russian: Царь-бомба; "Tsar Bomb") is the nickname for the AN602 hydrogen bomb, the most powerful nuclear weapon ever detonated. Its October 30, 1961 test remains the most powerful artificial explosion in human history. It was also referred to as Kuz'kina Mat' (Russian: Кузькина мать, Kuzka's mother), referring to Nikita Khrushchev's promise to show the United States a "Kuz'kina Mat'" at the 1960 United Nations General Assembly. 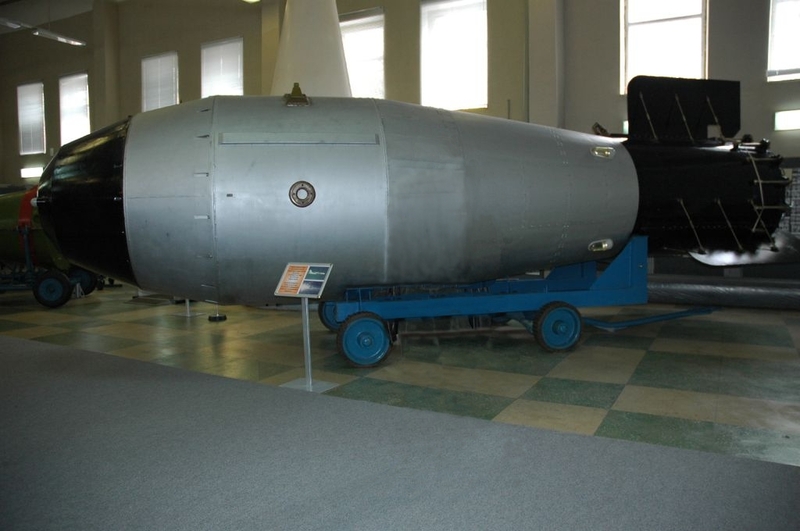 The famous Russian idiom, which has been problematic for translators, literally meaning “to show somebody Kuzka's mother”, equates roughly with the English “We’ll show you!” Developed by the Soviet Union, the bomb had the yield of 50 to 58 megatons of TNT (210 to 240 PJ). Only one bomb of this type was ever officially built and it was tested on October 30, 1961, in the Novaya Zemlya archipelago, at Sukhoy Nos. Many names are attributed to the Tsar Bomba in the literature: Project 7000; product code 202 (Izdeliye 202); article designations RDS-220 (РДС-220), RDS-202 (РДС-202), RN202 (PH202), AN602 (AH602); codename Vanya; nicknames Big Ivan, Tsar Bomba, Kuz'kina Mat'. The term "Tsar Bomba" was coined in an analogy with two other massive Russian objects: the Tsar Kolokol (Tsar Bell) and the Tsar Pushka (Tsar Cannon). The CIA denoted the test as "JOE 111". The Tsar Bomba was a three-stage Teller–Ulam design hydrogen bomb with a yield of 50 to 58 megatons of TNT (210 to 240 PJ). This is equivalent to about 1,350–1,570 times the combined power of the bombs that destroyed Hiroshima and Nagasaki, 10 times the combined power of all the conventional explosives used in World War II, or one quarter of the estimated yield of the 1883 eruption of Krakatoa, and 10% of the combined yield of all nuclear tests to date. A three-stage H-bomb uses a fission bomb primary to compress a thermonuclear secondary, as in most H-bombs, and then uses energy from the resulting explosion to compress a much larger additional thermonuclear stage. There is evidence that the Tsar Bomba had several third stages rather than a single very large one. The initial three-stage design was capable of yielding approximately 100 Mt, but it would have caused too much radioactive fallout. To limit fallout, the third stage and possibly the second stage had a lead tamper instead of a uranium-238 fusion tamper (which greatly amplifies the reaction by fissioning uranium atoms with fast neutrons from the fusion reaction). This eliminated fast fission by the fusion-stage neutrons, so that approximately 97% of the total energy resulted from fusion alone (as such, it was one of the "cleanest" nuclear bombs ever created, generating a very low amount of fallout relative to its yield). There was a strong incentive for this modification since most of the fallout from a test of the bomb would have ended up on populated Soviet territory. The components were designed by a team of physicists headed by Academician Yulii Borisovich Khariton and including Andrei Sakharov, Victor Adamsky, Yuri Babayev, Yuri Smirnov, and Yuri Trutnev. Shortly after the Tsar Bomba was detonated, Sakharov began speaking out against nuclear weapons, which culminated in his becoming a dissident. The Tsar Bomba was flown to its test site by a specially modified Tu-95V release plane, flown by Major Andrei Durnovtsev. Taking off from an airfield in the Kola Peninsula, the release plane was accompanied by a Tu-16 observer plane that took air samples and filmed the test. Both aircraft were painted with a special reflective white paint to limit heat damage. The bomb, weighing 27 metric tons, was so large (8 metres (26 ft) long by 2 metres (6.6 ft) in diameter) that the Tu-95V had to have its bomb bay doors and fuselage fuel tanks removed. The bomb was attached to an 800 kilogram parachute, which gave the release and observer planes time to fly about 45 kilometres (28 mi) away from ground zero. When detonation occurred, the Tu-95V fell one kilometer from its previous altitude due to the shock wave of the bomb. The Tsar Bomba detonated at 11:32 (Moscow time) on October 30, 1961, over the Mityushikha Bay nuclear testing range (Sukhoy Nos Zone C), north of the Arctic Circle over the Novaya Zemlya archipelago in the Arctic Sea. The bomb was dropped from an altitude of 10.5 kilometres (6.5 mi); it was designed to detonate at a height of 4 kilometres (2.5 mi) over the land surface (4.2 kilometres (2.6 mi) over sea level) by barometric sensors. The original, November 1961 A.E.C. estimate of the yield was 55–60 Mt, but since 1991 all Russian sources have stated its yield as 50 Mt. Khrushchev warned in a filmed speech to the Supreme Soviet of the existence of a 100 Mt bomb (technically the design was capable of this yield). Although simplistic fireball calculations predicted the fireball would impact the ground, the bomb's own shock wave reflected back and prevented this. The fireball reached nearly as high as the altitude of the release plane and was visible at almost 1,000 kilometres (620 mi) away from where it ascended. The subsequent mushroom cloud was about 64 kilometres (40 mi) high (over seven times the height of Mount Everest), which meant that the cloud was above the stratosphere and well inside the mesosphere when it peaked. The base of the cloud was 40 kilometres (25 mi) wide. All buildings in the village of Severny (both wooden and brick), located 55 kilometres (34 mi) from ground zero within the Sukhoy Nos test range, were destroyed. In districts hundreds of kilometers from ground zero wooden houses were destroyed, stone ones lost their roofs, windows and doors; and radio communications were interrupted for almost one hour. One participant in the test saw a bright flash through dark goggles and felt the effects of a thermal pulse even at a distance of 270 kilometres (170 mi). The heat from the explosion could have caused third-degree burns 100 km (62 mi) away from ground zero. A shock wave was observed in the air at Dikson settlement 700 kilometres (430 mi) away; windowpanes were partially broken to distances of 900 kilometres (560 mi). Atmospheric focusing caused blast damage at even greater distances, breaking windows in Norway and Finland. The seismic shock[verification needed] created by the detonation was measurable even on its third passage around the Earth. Its seismic body wave magnitude was about 5 to 5.25. The energy yield was around 8.1 on the Richter scale but, since the bomb was detonated in air rather than underground, most of the energy was not converted to seismic waves. The TNT equivalent of the 50 Mt test could be represented by a cube of TNT 312 metres (1023 feet) on a side, approximately the height of the Eiffel Tower. The Tsar Bomba is the single most physically powerful device ever used by mankind. By contrast, the largest weapon ever produced by the United States, the now-decommissioned B41, had a predicted maximum yield of 25 Mt, and the largest nuclear device ever tested by the United States (Castle Bravo) yielded 15 Mt (this was due to an unexpected runaway lithium-7 reaction; the preliminary prediction for the yield was from 4 to 6 MT: a 6 Mt maximum predicted yield). The largest weapons deployed by the Soviet Union were also around 25 Mt, as in the SS-18 Mod. 2 ICBM warheads. The weight and size of the Tsar Bomba limited the range and speed of the specially modified bomber carrying it and ruled out its delivery by an ICBM. Much of its high-yield destructiveness was inefficiently radiated upwards into space. It has been estimated that detonating the original 100 Mt design would have released fallout amounting to about 25 percent of all fallout emitted since the invention of nuclear weapons. Hence, the Tsar Bomba was an impractically powerful weapon. It was decided that a full 100 Mt detonation would create too great a risk of nuclear fallout, as well as a near certainty that the release plane (and crew) would be destroyed before it could escape the blast radius. A bomb dropped without benefit of advanced inertial navigation systems could easily miss its intended target. Parachute retardation would only worsen the bomb's accuracy. Thus certain bombs were designed to destroy an entire large city even if dropped five to ten kilometers from its center. This objective meant that yield and effectiveness were positively correlated, at least up to a point. However, the advent of ICBMs accurate to 500 meters or better made such yields unnecessary. Subsequent nuclear weapon design in the 1960s and 1970s focused primarily on increased accuracy, miniaturization, and safety. The standard practice for many years has been to employ multiple smaller warheads (MIRVs) to "carpet" an area, resulting in greater ground damage. With the nuclear bomb being so powerful at 100 megatons more of the explosion went upwards instead of outwards to affect more of that designated area, instead radiation would be sent into the atmosphere and in turn affect the country that originally launched the bomb. 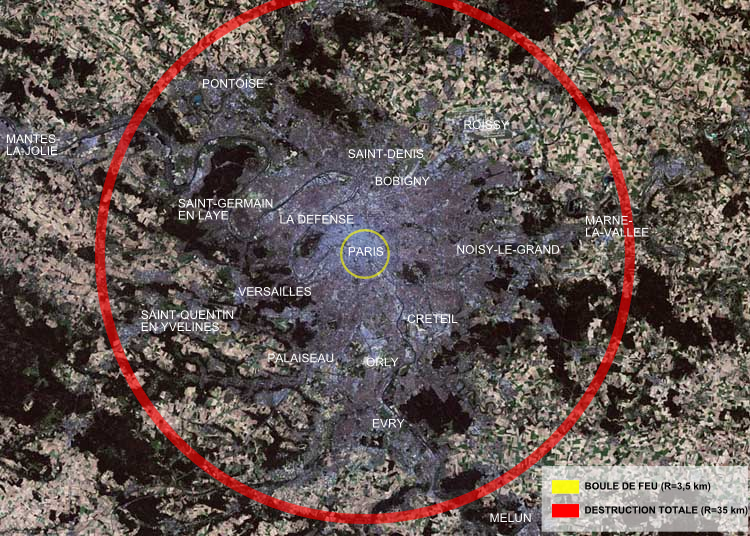 Zone of total destruction of the Tsar Bomba (as an example – over a map of Paris): red circle = total destruction (radius 35 kilometres (22 mi)), yellow circle = fireball (radius 3.5 kilometres (2.2 mi)). Footage from a Soviet documentary about the bomb is featured in Trinity and Beyond: The Atomic Bomb Movie (Visual Concept Entertainment, 1995), where it is referred to as the Russian monster bomb. The movie states that the Tsar Bomba project broke the voluntary moratorium on nuclear tests. In fact Soviets restarted their tests and broke the unilateral voluntary moratorium two months before Tsar Bomba, and since the moratorium was unilateral there was no multilateral legal obstacle (earlier the U.S. also declared a one year unilateral moratorium on nuclear tests and as that year expired the US had already announced that it considered itself free to resume testing without further notice but had not resumed tests until the aftermath of Tsar Bomba). A one hour episode of the PBS documentary series Secrets of the Dead – "World's Biggest Bomb" (2011; Blink Films & WNET) – chronicles the events leading to the detonations of Castle Bravo and the Tsar Bomba. ↑ 2.0 2.1 2.2 Sakharov, Andrei (1990). Memoirs. New York: Alfred A. Knopf. pp. 215–225. ISBN 0-679-73595-X. ↑ Khalturin, Vitaly I.; Rautian, Tatyana G.; Richards, Paul G.; Leith, William S. (2005). "A Review of Nuclear Testing by the Soviet Union at Novaya Zemlya, 1955–1990". pp. 1–42. Digital object identifier:10.1080/08929880590961862. Archived from the original on 2006-09-08. http://web.archive.org/web/20060908073452/http://www.princeton.edu/~globsec/publications/pdf/13_1-2khalturin+NZ+1-42+.pdf. Retrieved 2006-10-14. ↑ 4.0 4.1 Central Intelligence Agency, National Intelligence Estimate 11-2A-62, "Soviet Atomic Energy Program", (16 May 1962), pages 2 and 13. ↑ The yield of the test has been estimated at 50 to 58 megatons of TNT (210 to 240 PJ) by different sources over time. Today all Russian sources use 50 megatons as the official figure. See the section "Was it 50 Megatons or 57?" at "The Tsar Bomba ("King of Bombs")". http://www.nuclearweaponarchive.org/Russia/TsarBomba.html. Retrieved 2005-01-01-2006. ↑ DeGroot, Gerard J. The Bomb: A Life. Cambridge, Mass. : Harvard University Press, 2005. p. 254. ↑ 7.0 7.1 7.2 "Tsar Bomba". Nuclear Weapon Archive. http://www.nuclearweaponarchive.org/Russia/TsarBomba.html. Retrieved 2007-11-03. ↑ 8.0 8.1 8.2 Adamsky, Viktor; Yuri Smirnov (Fall 1994). "Moscow's Biggest Bomb: the 50-Megaton Test of October 1961" (PDF). pp. 3, 19–21. http://www.wilsoncenter.org/topics/pubs/ACF1B7.pdf. Retrieved 2011-10-07. ↑ 9.0 9.1 "The Tsar Bomba ("King of Bombs")". http://www.nuclearweaponarchive.org/Russia/TsarBomba.html. Retrieved 2010-10-10. "Despite being exploded in the atmosphere, it generated substantial seismic signals. According to a bulletin of the U.S. Geological Survey it had seismic magnitude mb = 5.0 to 5.25. ... from fireball radius scaling laws, one would expect the fireball to reach down and engulf the ground ... In fact, the shock wave reaches the ground ... and bounces upward, striking the bottom of the fireball, ... preventing actual contact with the ground." ↑ "Big Ivan, The Tsar Bomba ("King of Bombs")". http://nuclearweaponarchive.org/Russia/TsarBomba.html. Retrieved 12/7/12. ↑ E. Farkas, "Transit of Pressure Waves through New Zealand from the Soviet 50 Megaton Bomb Explosion" Nature 4817 (24 February 1962): 765–766. ↑ "Tsar Bomba's Blast Wave Orbited Earth Three Times in 1961". Pravda.ru. 2009-09-24. http://english.pravda.ru/russia/history/17-09-2009/109339-tsar_bomba-0. Retrieved 2009-09-24. ↑ "Trinity and Beyond: The Atomic Bomb Movie." Nuclear Weapon Archive, 15 August 1999. ↑ Sherman, Robert. "Comprehensive Test Ban Treaty Chronology." Federation of American Scientists, May 30, 2008. Wikimedia Commons has media related to Tsar Bomba.